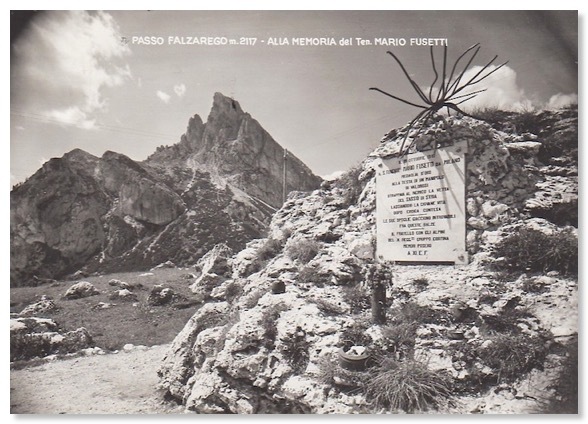 There is more on this page about the Falzarego war memorial. 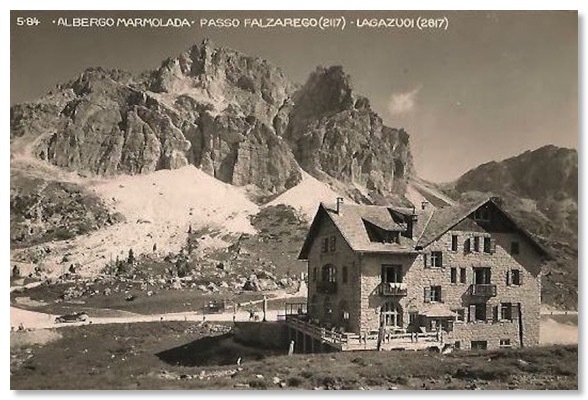 Both of the Zardini guides contain this same photograph. 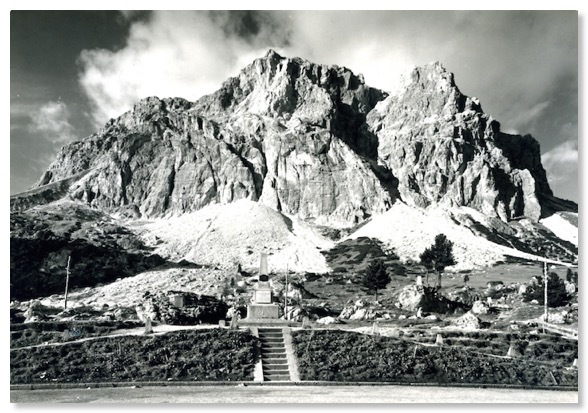 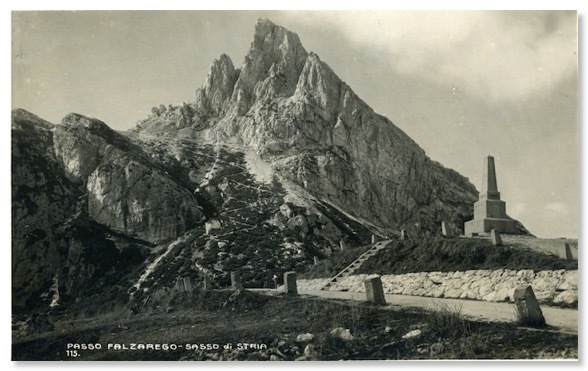 The prominent pyramid of the Sasso di Stria and the alignment of its subsidiary tops ought make this a straightforward photo to emulate. 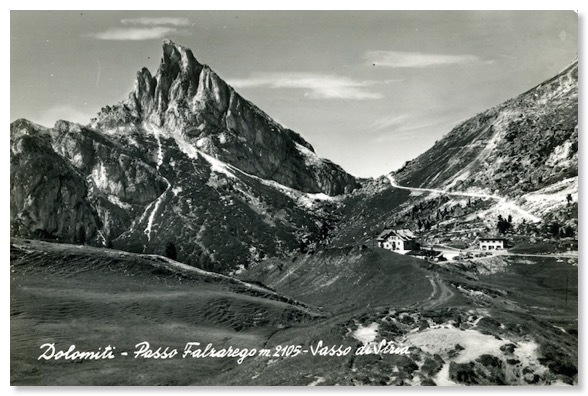 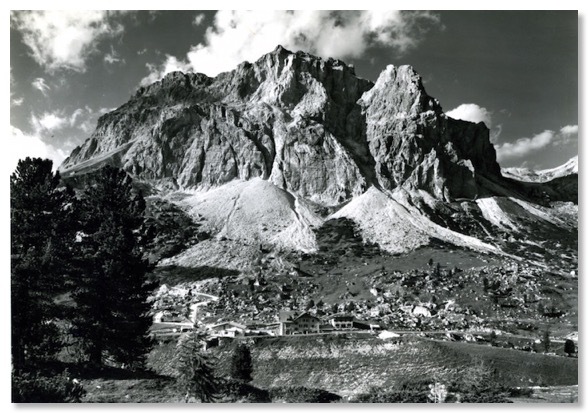 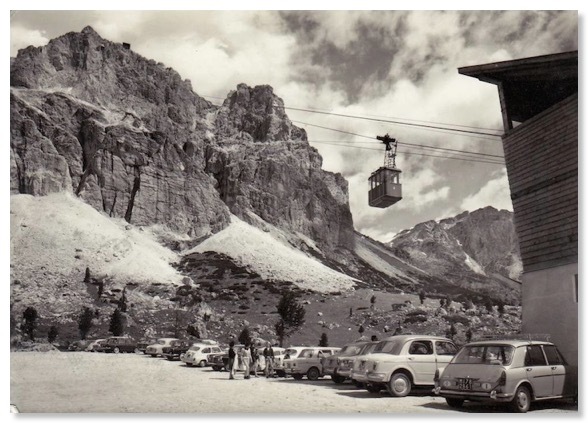 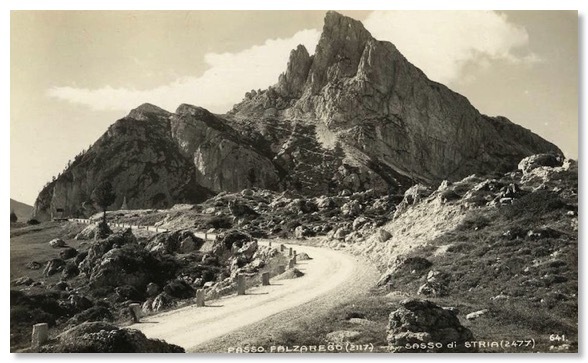 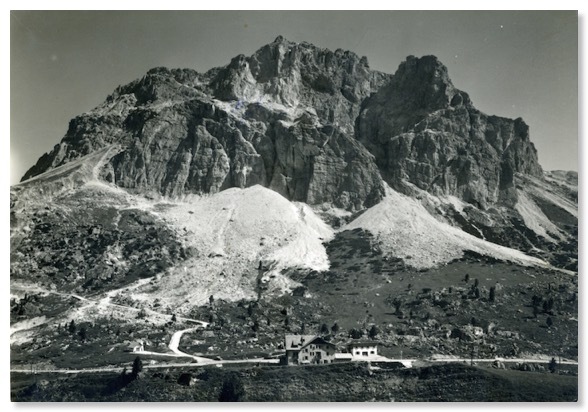 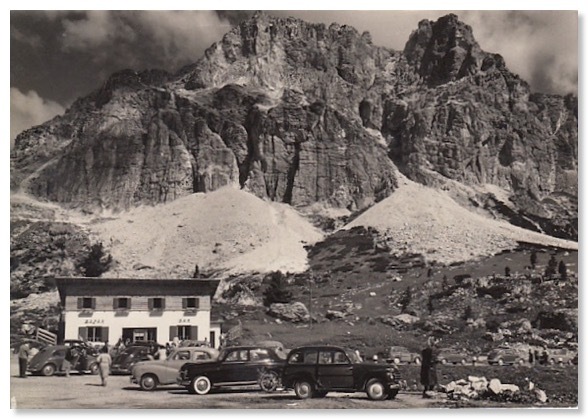 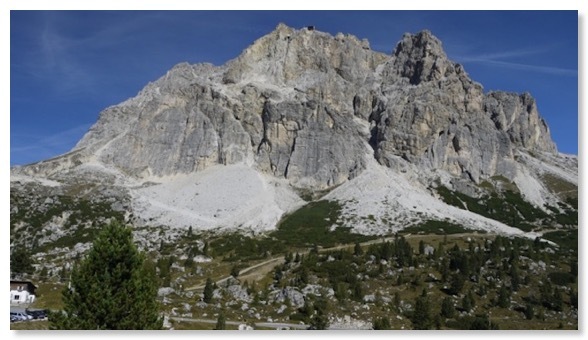 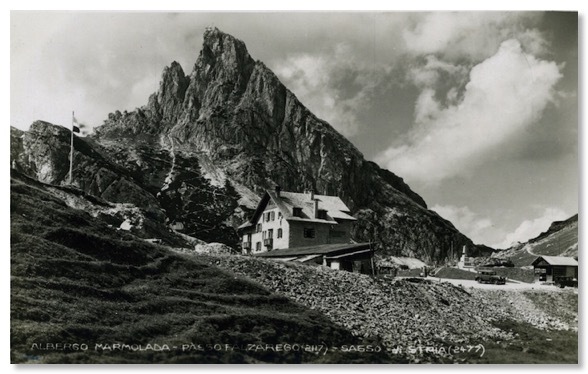 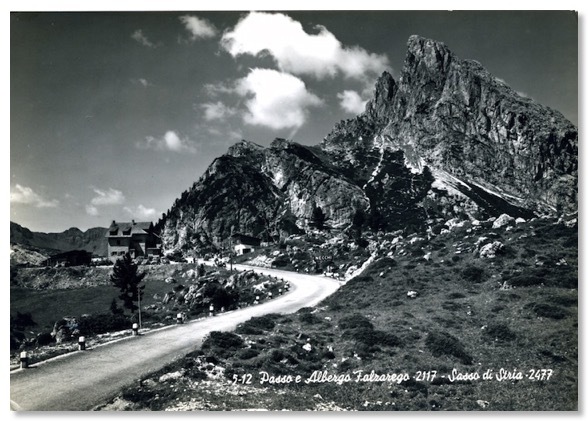 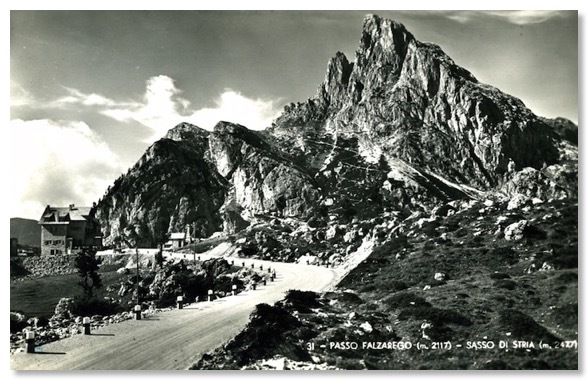 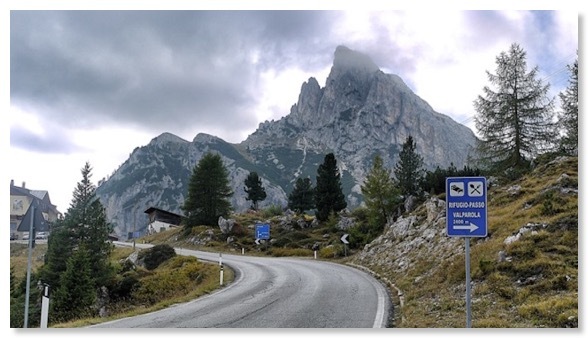 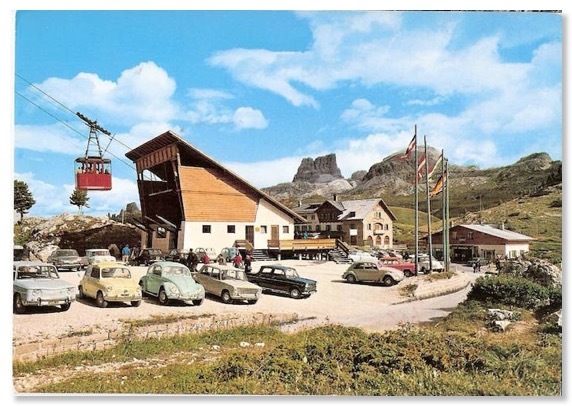 However, as mentioned in the details for Photo 26, this area underwent many changes after the First World War and subsequently, as roads were improved and the cluster of buildings at the head of the Falzarego Pass were established. 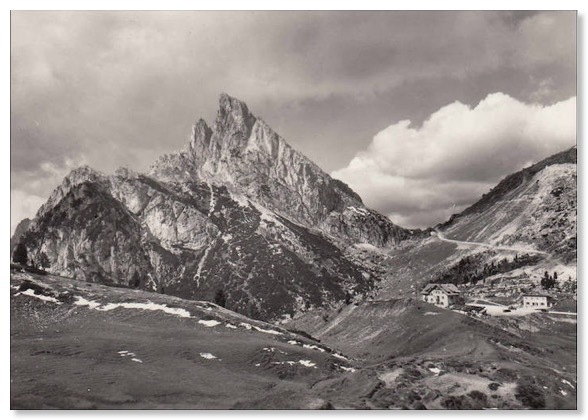 My own photograph is as close an approximation of the main elements as can be obtained on the ground nowadays of the shot Zardini took. 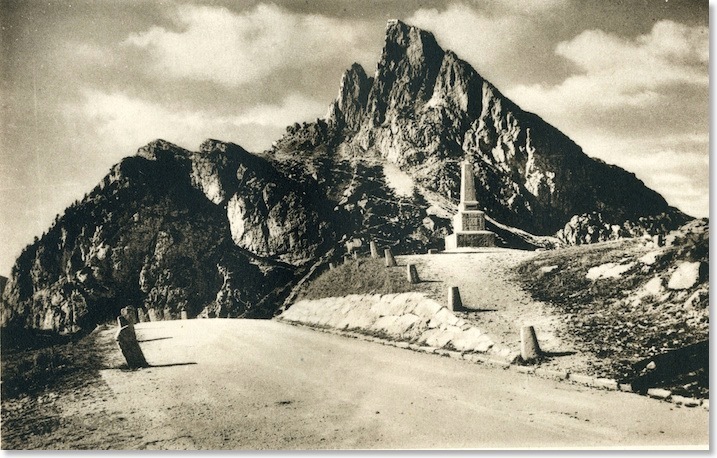 It is no longer possible, because of buildings, to get a clear view further away from the obelisk nor to line it up with the mountain summit as per Zardini’s photo, and I believe that it will at some time have been moved back from The Road and away from the encroachment of the car-park excavations. 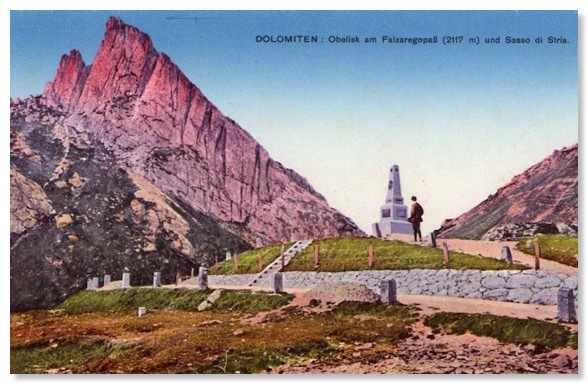 The clothing in these next two postcard photos date them to the 1920s even in the absence of other evidence. 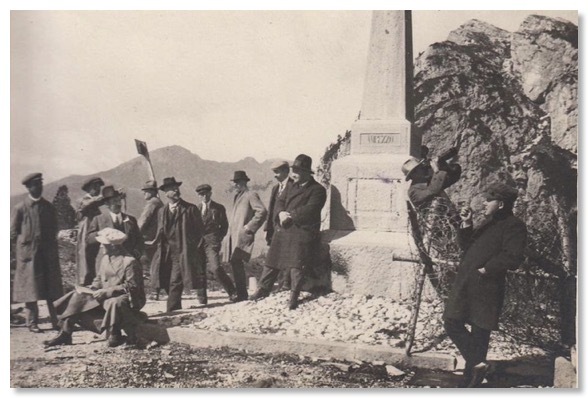 It also appears to me that the war memorial has been drilled to accept four bolts where the marble plaque is nowadays. 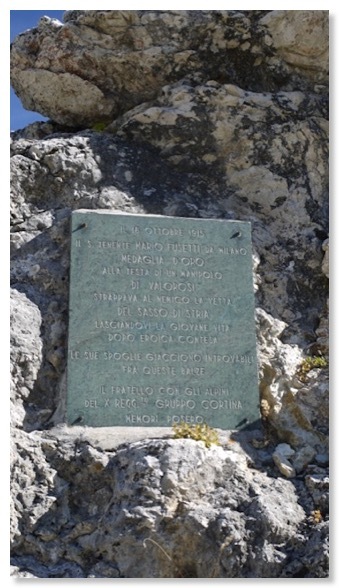 There also seem to be other drilled holes, which can be seen in the closer photos of the obelisk under Photo 26. 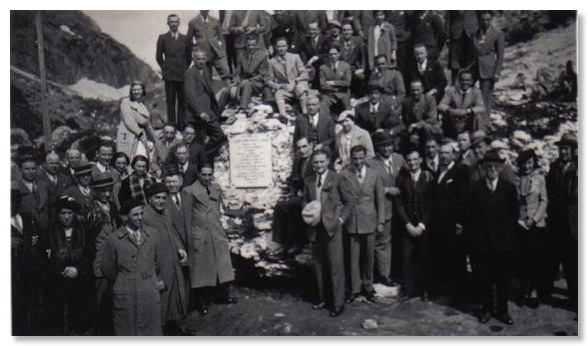 In the absence of any other dating evidence - neither card was ever posted - I wonder whether these photographs commemorate the installation of the plaque and metal adornment? 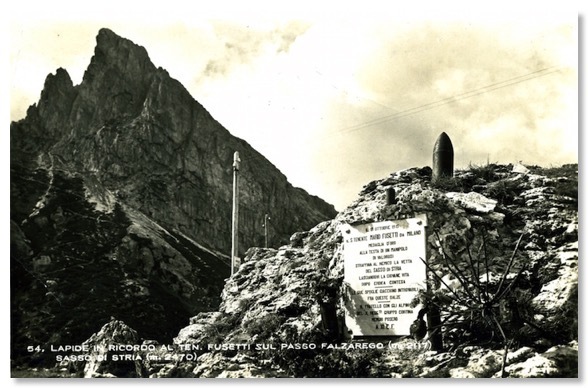 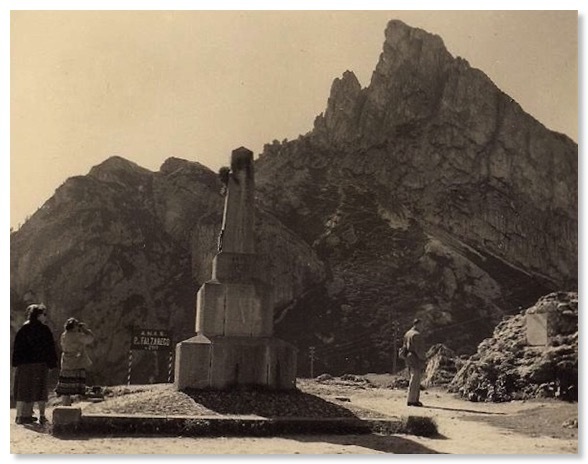 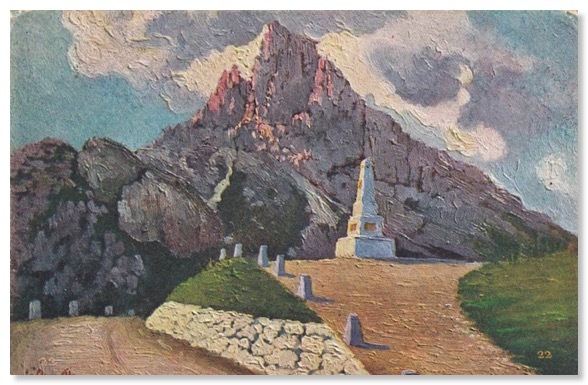 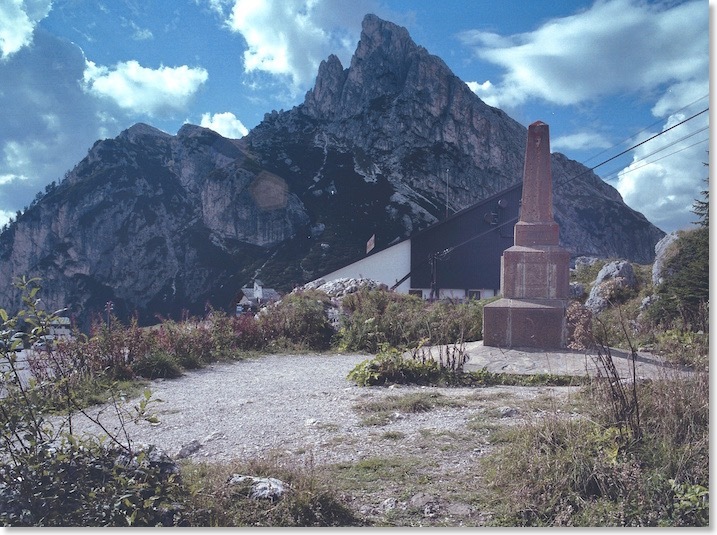 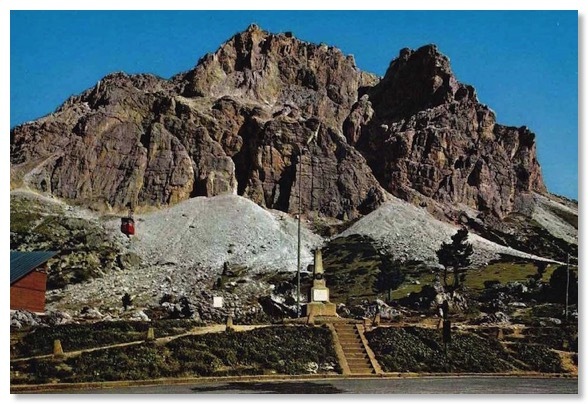 Were they, say, from 1926, they could be from an event at which veterans celebrated the tenth anniversary of the fighting on Cima Lagazuoi, behind the monument, and would be a year after date of the quote from climber Guido Rey that is on the plaque. 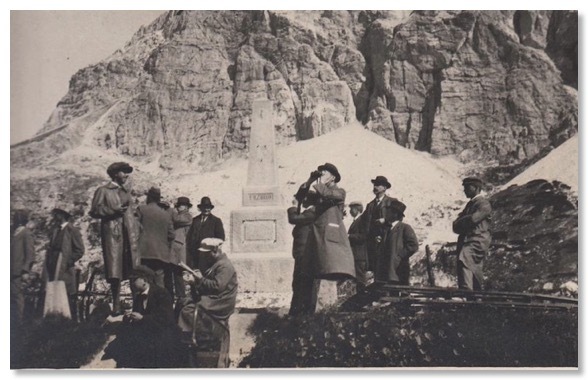 Note the pipe-smoking figure on the right in the first photo above is leaning against a WWI barbed wire barrier. 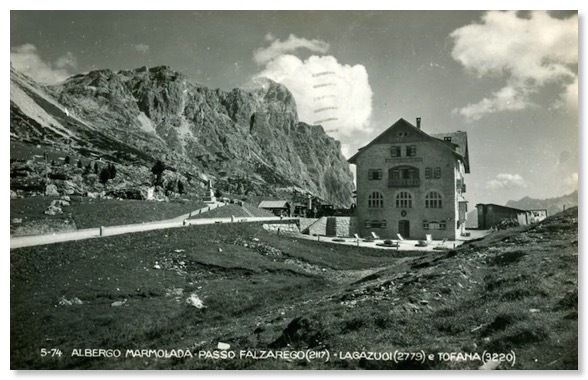 These buildings were well-established by the time that a local postcard photographer took this picture from a very similar spot, during the 1930s.